The bottom panel provides access to connection, process, port, WHOIS, and system info. 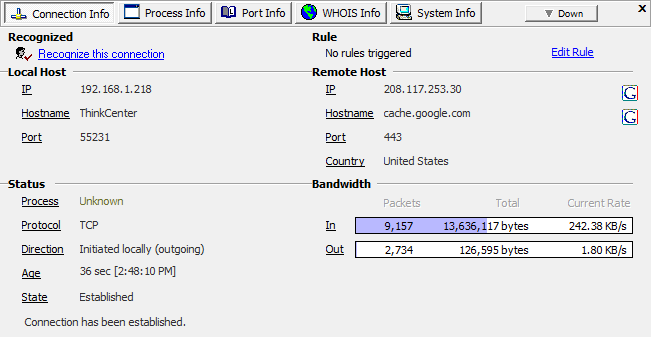 Here the Connection Info tab provides available information on the TCP connection. X-NetStat shows applications that handle TCP and UDP traffic. The Process Info tab displays the basics about the process, which includes embedded version information, MD5 hash info, and whether the file is digitally signed. You can also launch Process Explorer by SysInternals from X-NetStat to show extremely detailed information. An integrated WHOIS browser easily looks up records for IPs and domain names. Requests are automatically routed to the appropriate WHOIS server. Example message alert from a triggered rule. 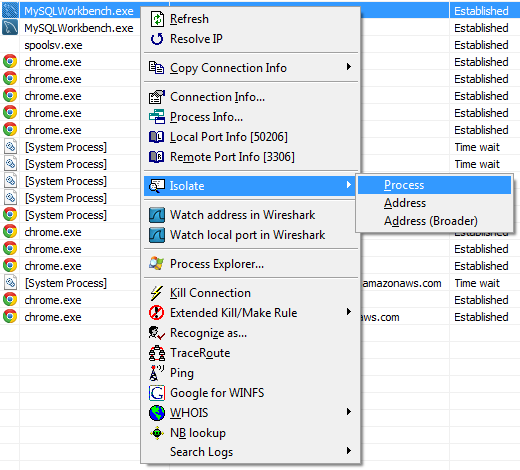 Access program features and commands in context of any connection. Just right-click. Pull up vitals for your network interface cards, including statistics for the IP, ICMP, TCP/IP, and UDP protocols.